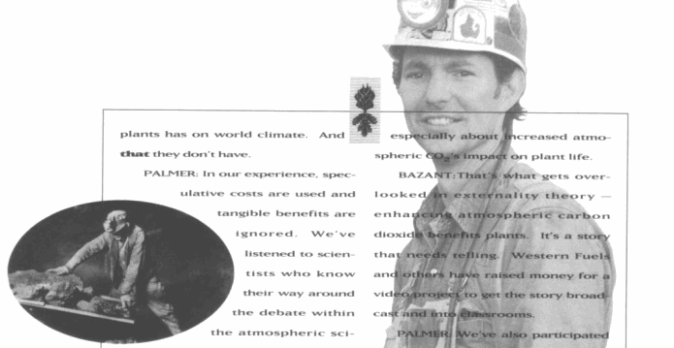 In this section of the Western Fuel Association’s (WFA) 1991 annual report, CEO Fred Palmer and Board of Directors President Stan Bazant discussed how the coal industry should address climate change. The two leaders warned of the “huge potential impact of a lopsided global warming debate on coal-based utilities” and defended their efforts to challenge the “perception that burning coal causes global warming.” In doing so, they recounted WFA’s history of opposition to regulation of CO2 emissions, stating that the Board amended it’s goals and objectives “to highlight a growing concern about carbon taxes” in 1989. Palmer also lauded a project “to measure public opinion about the global warming issue and to see if a factual, science-based public information campaign can have an impact.” This “project” maybe referring to the Information Council on the Environment (ICE), an advertising campaign designed to attack proponents of global warming. The campaign was curated by a coalition of fossil fuel utilities including WFA, Southern Company, and the Edison Electric Institute. More documents on ICE can be found here on Climate Files.